Swagbucks – How To Make More Money! Have You Tried Swagbucks yet? There are so many different websites out there that claim to be able to pay you for doing simple things online. Sometimes they will pay you to complete surveys, search the internet, playing games or reviewing a website. 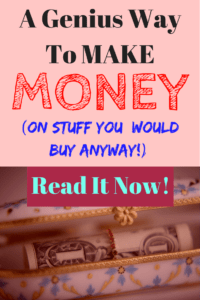 These sites can be great ways to make more money online. We have tried most of these sites and some of them are not so honest or legit. Today we would like to introduce you to one of our favorite websites that can be a great way to make some extra money. Swagbucks is one of the most popular and legitimate websites that can help you make some extra money online. The Swagbucks site has been around for a long time and has proved to be a legitimate way for millions of people to make a little extra money. We have tried all of the similar sites and we honestly think that this is the one that you should start with if you are new to these types of sites. 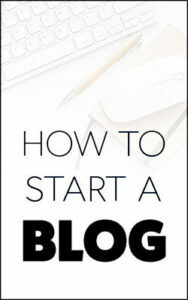 It is very easy to make a few extra dollars with the site in your spare time. Note: You will not be able to make a full-time living with this site! Just use it to earn a few extra dollars on the side and we promise you will love it! They are owned by a company called Prodege LLC. Prodege is a well-known provider of incentivized online reward portals. They have some very famous partners (e.g The New York Giants, WGN America, World Wresting Entertainment to name just a few of the big brands that they work with. Prodege runs the fastest growing online rewards programs in the world – these guys are the main players in the industry! SwagBucks is a website that we have used daily to earn some Amazon gift cards with very little work. They are a very well-known company and we have found them to be very trust-worthy. The name is a pretty genius move by the marketing department – it is catchy and not easily forgettable! You use Swagbucks just like Google for online searches. However, with Swagbucks you get reward points (called SB) for the things you do through their website. Then, when you have enough SB’s, you can redeem them for cash, gift cards, and more. I am not exactly sure why they called the points SB’s and make the conversion rate of SBs to Dollars so ridiculously low. My guess is that when a user earns 1 SB, it seems like it is worth a lot more than if they told you that you had earned just 1 cent. This comes across as a little deceptive but we can forgive them for that. It is probably just a marketing trick, rather than a serious way to pull the wool over the users eyes. You’ll receive an SB (Worth $3) sign-up bonus just for signing up today! The Swagbucks user interface is pretty simple and fun to navigate. The first impression is that this a very polished and professional site. To get started, simply go and sign-up and then download the Swagbucks toolbar. You can then do your internet searches using the toolbar and make some extra money for your efforts! You can also just use the search feature on the website itself (shown below) to do your usual internet searches but earn money while doing it! 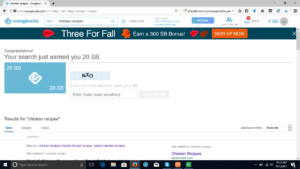 Every time that you do a search using the Swagbucks search engine, you can earn ‘Swag Bucks’ which can be converted into cash, gift cards or prizes. This is pretty easy money for just searching the internet as you normally would! The Swagbucks search engine is very similar to Google and we have always had very similar results from it. There really is no down side to using the Swagbucks search engine instead of Google. Trust me – Google will never pay you to do searches! Here is an example of how easy it is to earn Swag Bucks with the search engine. We opened a new Swagbucks account this morning, and just searched for ‘Chicken Recipes’. We earned 20 SB immediately for doing that! You can see that you will also get offered a ton of great coupons and discount offers for using Swagbucks as well. 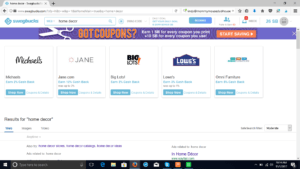 These coupons can help save you a TON of money, especially during the holiday season when a lot of vendors are promoting deals and giving special discount coupons. We did another search for home decor ideas this morning and there was no shortage on the cash back offers that were being presented to us! Check out the screenshot below. Some of those offers are 12% cash back – that is great! We really love cash back deals (check out Ebates and MyPoints). MyPoints is great and they are also owned by the same company (Prodege LLC) that owns Swagbucks. Swagbucks is immediately useful for saving money and earning a little extra through online searches. There is so much more to it though – seriously this is a complete money-saving AND money-making platform! From our experience they are a legitimate website that does not try to scam you. They are registered with the Better Business Bureau (BBB) and they currently have an A rating with them. This is a very good sign that you can trust the site. Here is a link to the BBB page for the site. We have received payouts from them and they claim that they have paid out over $80 Million to users. There is no evidence that we could find that suggest that they are not a legit site. There are quite a few reviews online about Swagbucks. Many of the reviews are positive, but there a few people complaining that they did not make enough money from them. We see this all the time with this type of survey or rewards site. The best thing to do is to just try the site for yourself – it is totally free so you have nothing to lose. If you do not like the rewards or the rate of earnings is just too low for you – then just move on to another site. There is no point in writing a review that says they are a ‘scam’ or whatever, just because you din’t personally like the site or find that it was worth your time. Yes. It is as safe as any other webpage out there. We have been using Swagbucks for quite a while now and we have had no problems. The worst thing that will happen is that you might get a bunch of unwanted emails sent to you. We always sign-up to sites like this with a dedicated email address, that way our main email account is not bombarded with unwanted emails. No Obligation Special Offers – As a member of Swagbucks you will be eligible for some special offers that they send to you. These offers might be for survey sites, cash back sites or special discounted offers. You are not obligated to participate in any of these offers but they can earn you some nice Swagbucks! 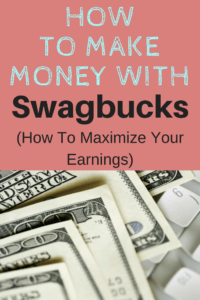 Shopping to Earn Swagbucks – Simple! Just shop like you normally would and earn some nice Swagbucks for doing it! Get Swagbucks for your old cell phone – Yup, they will give you Swagbucks for old cell phones! We haven’t done this yet so we have no idea if you get a good deal or not! Complete Surveys for Cash – This is an easy way to make more money online. Swagbuck surveys are good but make sure to check out our top 5 highest paying surveys and add those to your income sources. Online Polls – Swagbucks offers daily polls that you can complete and earn Swagbucks. Much easier and faster than taking full surveys. Games – You can earn SBs by playing games on the site. Typically, you will only get a few cents per game but it is better than nothing if you were going to play the games anyway! You can also get paid $3 when you refer someone to Swagbucks. This is pretty easy – and yes I get a few dollars if you sign-up through my link – but so do you! If you refer your friends you also receive 10% of their earnings from the site for life! It is not like the 10% gets taken from the referee – you just get extra money from the company for the referral. We highly recommend that you make Swagbucks a daily habit – be careful though it is highly addictive! We have never seen such a complete platform that helps you save money and make money with just the press of a few buttons. We all know that you will not become a millionaire just from using this platform, but it can help dramatically improve your finances over time. The Swagbucks search engine feature is as good as google – so why not use it to make some extra money for searches that you would be doing anyway!? You will receive an SB (Worth $3) sign-up bonus just for signing up today! We hope that you found this Swagbucks review helpful and please comment below to let us know how you like Swagbucks! We hope you learned how to make money with Swagbucks! It really is a cool site if you are looking for ways to make a little bit extra money. Be sure to comment below if you have tried it ! We love Swagbucks and highly recommend it if you are looking for ways to save money and make some more money! I used Swagbucks years ago. I totally forgot about it. I wrote about ebates in my recent gift list post . but Swagbucks gives you even another layer of earning. If you are going to search and shop online you might as well earn a little while you are at it. It really does add up. I found you via a facebook group we are in together and glad I popped on over to this post. I will sign up for Swagbucks again using your link. Thanks for the tips. Feel free to leave me a comment on that blog post so more of my readers learn about Swagbucks for their Christmas shopping. Hi Stacy, thanks for your comment ! I love your article (https://www.alesstoxiclife.com/health/christmas-gift-ideas/). Can you imagine how much the average family will save xmas shopping just by using Ebates etc!? We love Ebates, we make an extra $100 – $200 per month using it to buy stuff we would buy anyway! Truly a passive income source and a great habit to get into! Wishing you and your family a magical holiday season! P.S I tried to comment on your blog post but the form would not submit – not sure what was going on but I will try again later today. Sunainas – Thank you very much for your kind comment!